Related: Elizabethan Holidays: Christmas, New Year’s Day… and Plough Monday? One feast in the parish of St. Mary, for example, included eggs, butter, currants, pepper, saffron, veal, lamb, honey, cream, bread, custards, pastries, and eight firkins of beer. Hutton reports that entertainments were equally elaborate, consisting of morris dancers, minstrels, fools, fireworks, and plays. He also notes, however, that such merriment may have reached its heyday under Elizabeth. The reasons for this were myriad. In medieval times, society was largely agrarian. Holiday customs, passed from one generation to the next, revolved around the seasonal cycle of planting, sowing, and harvesting. They also derived from saints’ days and other traditions of the Catholic church, as well as from pagan beliefs and superstitions. As scholar François Laroque notes, “essentially the festival was the product of a rural civilization whose seasonal rhythms and magico-religious beliefs were linked with the mysteries of natural fertility.” Several things conspired to change this. When Henry VIII declared himself the head of the Church of England in 1534, he issued royal decrees banning religious holidays observed under the Catholic calendar. 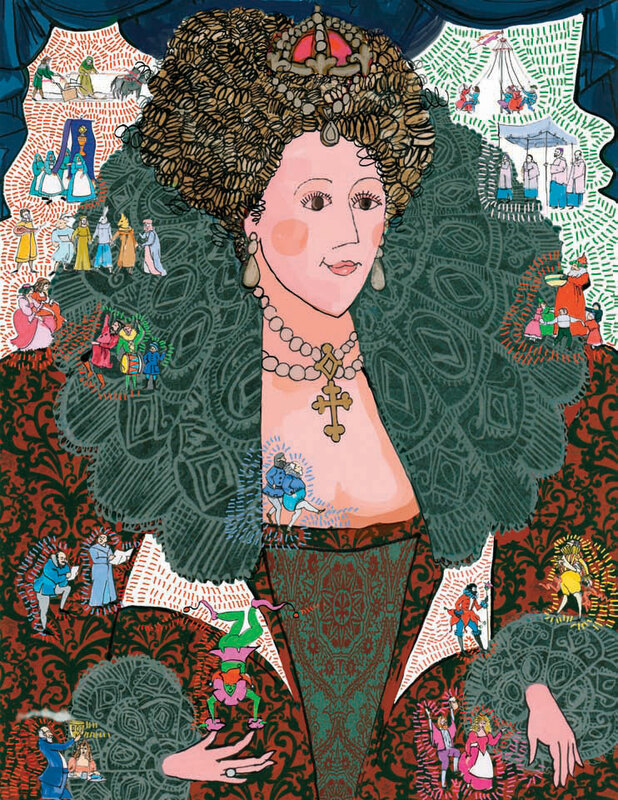 These reforms percolated slowly through the populace, but eventually traditional religious observances began to give way to a new era of more civic and national holidays under Elizabeth I. Never one to deprive her subjects of an excuse for merry-making, the Queen created new holidays such as Accession Day to replace those previously devoted to saints. In effect, as Laroque notes, “a cult of the ‘virgin queen’ gradually superseded the old festivals devoted to the Virgin Mary.” Under Elizabeth, festivals became a form of political theater calculated to put her administration in a good light and to win the approval and the gratitude of her people. Social, economic, and religious factors also changed the nature of celebrations. Both the nobles and the townsfolk sought to distance themselves from the communal rituals of the past and embrace the enlightened spirit of the age. The population was shifting from the countryside to the towns and cities, leaving behind the village church and churchyards that had provided both the heart and the space for the traditional festivals that were part of the seasonal cycle of country life. As Hutton writes, “a flourishing tradition of communal festivity was increasingly challenged by the social elite, motivated partly by evangelical religious renewal and partly by economic alterations.” Charitable traditions such as inviting the parish poor to one’s table for a Christmas feast, for example, became casualties of these new attitudes. While Stubbes’s sputterings seem almost comical today, the groundswell of conservative religious sentiment was no laughing matter. In response, after Elizabeth’s death, James I approved the sabbatarian bill that the Queen had vetoed in 1584, thus prohibiting amusements on Sundays. It was clear that the passing of Elizabeth had ended an era. But while the reformers may have succeeded in squelching the ‘ungodly’ festivals and saints’ days, their strict observance of the Sabbath left us with perhaps a more welcome legacy long after the fact in the introduction of—the weekend! Thank you for your enlightening article. I’m writing a story about an Elizabethan manor renovated in the 19th century, and I have these poor, stuffy Victorians trying to figure out how to make merry the Olde Fashioned way without making fools of themselves. This helped!